Order Violife Pizza Slices from the Online Health Food Store UK. Buy Violife Dairy Free Alternative to Cheese Pizza Slices - 200g and other quality Dairy Free Cheese safely online in the UK. Try Violife with pizza flavour and enjoy this unique guilt free combination in your baguettes and toasted sandwiches. If you want to automatically receive an email when 'Violife Pizza Slices' is back in stock, just leave your email address below. Water, coconut oil (23%), modified starch, starch, sea salt, flavourings (contain celery products), olive extract, colour: b-carotene, vitamin B12. Our UK Health Shop sells real Violife and other Dairy Free Cheese from top-quality brands safely online to customers throughout the United Kingdom in England, Wales, Scotland and Northern-Ireland. View more products on the Online Health Food Store from Violife. Where to buy Violife Pizza Slices safely online? Shop at the Online Health Food Store if you are wondering where you can buy Violife Dairy Free Alternative to Cheese Pizza Slices - 200g safely online in the United Kingdom. Our Health Shop is located in the UK and our award-winning independent has been serving customers in England, Wales, Scotland and Northern-Ireland since 1976. You can buy our Dairy Free Cheese online and we post out orders to any UK address. 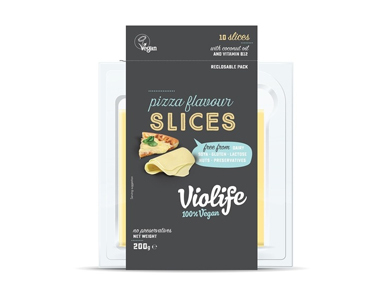 Violife Pizza Slices - Violife Dairy Free Alternative to Cheese Pizza Slices - 200g in Dairy Free Cheese and Chilled Foods.